Let us solve all your mole and gopher problems and stop all the damage they cause. We are Lake Oswego's mole and gopher removal professionals. There is nothing more annoying than spending time and money to get your yard and garden in perfect shape then see it destroyed. The best thing to do is trap and remove the moles as soon as you see the first sign of damage. We can quickly come to your property and setup a trapping plan that can sole your problem and clean up your yard or garden. 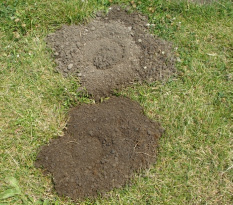 When you first notice that you have mole hills in your yard we recommend getting them removed. The longer you allow moles to move around your property, the more tunnels they are creating. This means that they have to push the dirt above ground onto the grass killing it. We are a professional, licensed, and insured mole and gopher control company. This is not a hobby like many of our competitors. We have over 10 years of experience and customer satisfaction is out number one priority. We have been providing mole trapping and gopher removal in Lake Oswego with great success. We are able to stop the damage and get your property back to looking great again. Lake Oswego mole trapping is your best solution to stopping mole hills in your yard. 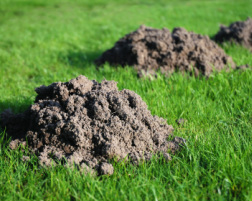 When you have mole hills in your yard in Lake Oswego it can be very frustrating and the damage will only get worse if you do not have them removed. We have been solving mole and gopher damage in Lake Oswego for many years. We are able to remove the pest moles from your yard and stop the damage before it gets even worse. The main method that we use is mole trapping because it is the most effective method to stop mole damage. Depending on the type of damage and soil we have two different types of traps we use. The most common trap that we use is the mole scissor trap that is a quick killing trap. For these traps to work they need to be set in proper locations with the right strategy. Being the best Lake Oswego mole trappers we can quickly setup traps that will get rid of the moles and damage on your property. Voles can cause large problems in field or yards if left uncontrolled. We are Lake Oswego vole trapping professionals and can solve your problem. Vole's are small rodents that look alot like mice, but have smaller tails and bigger ear's. They are burrowing rodents that create small golf ball sized holes throughout a yard. Yard mole removal in Lake Oswego is something that we recommend be done by a professional. When it comes to removing these nuisance pests the sooner you can remove moles from your lawn the better. The method that we use is mole trapping in LO because we have found it to be the quickest way to stop mole damage in the lawn. We do not offer mole pest control services that put out mole poison because it is not effective. Also we do not like to use anything that could harm non target animals or pets. Below is a recent Lake Oswego mole trapping job that we solved. ​A family had just reseeded their yard after a very expensive landscape makeover. They were excited to show off their new garden, rock wall, and soon to be green grass. But after the construction was completed they noticed something was pushing up the newly seeded ground. At first they would just step down the ridges and go about their day. Then one morning they woke up to find 8 large dirt mounds that piled up on the new seed. This was killing the new grass and ruining the lawn they paid so much money to get planted. As most people do they went to the local hardware store and bought many different products including mole poison and repellent. After almost $100 and seeing no results they had enough and decided to hire a professional. We received their call and could tell that it was a mole damage emergency. The longer the mole's were running free in the yard, the more dirt mounds would pop up. We were able to come out the same day and do an inspection of the property. A non- professional trapper would set a trap right at the dirt mounds, but we have years of experience and know that is not the best location for a quick catch. We probed around the yard to locate the main travel tunnels. We knew from our knowledge of moles that they use these every 8-12 hours. Because it was a newly seeded yard we did not want to dig a big hole and kill more grass. We were able to locate a main tunnel that was running along side the yard. For this average size yard we set 5 mole traps. Then we removed the dirt mounds from the seeded area and leveled any other sign so we could see fresh active next visit. When we returned to our customers property on our next visit they were very happy. We knew that we had trapped the pest moles and stopped the damage. We were able to remove the traps and told them to contact us if they see any new dirt mounds in the near future. Overall this was a very quick mole removal solution and is not always the case. For larger mole infestations you can have damage coming from neighbors properties.